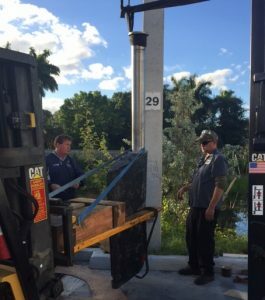 When a 126’ San Lorenzo yacht was recently hauled at Lauderdale Marine Center for a number of projects, the captain came to us with vibration concerns with the vessel. Vibration in the running gear can be caused by a number of different issues ranging from bent shafts to misaligned struts or engines to out-of-true props. Our running gear mechanics were dispatched to check out the boat and perform inspections on the various components. We found that the shaft had good run-out, no signs of damage and had recently installed new cutlass bearings, so there was no reason to pull the shafts. We did however, pull the props and sent them out for reconditioning. The captain of this yacht took proactive measures at the first sign of a potential problem, resulting in a simple fix to a small issue before it became a major job. This yacht should now be ship-shape for future smooth sailing. A 1987 121’ Heesen Yacht, hauled at Lauderdale Marine Center, was showing the wear and tear you would expect on a 30 year vessel. The captain and engineer on this yacht contracted both High Seas Yacht Service and High Seas Hydraulics to perform a number of tasks on both the hydraulic systems and running gear. 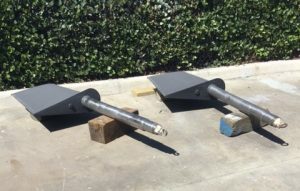 As part of the running gear work, our High Seas Yacht Service team pulled the rudders for routine maintenance. Upon removal of the rudders, we found significant corrosion in the rudder housing in the area of the packing glands. Prolonged exposure to salt water can cause corrosion of aluminum by creating aluminum oxide. The salt does not directly attack the aluminum, but causes an electrochemical attack like a catalyst that results in the corrosion. This is the white deposit that you find on aluminum. The reaction rate is usually fairly slow, but on this 30 year old vessel the salt water had definitely taken its toll. Once the rudders were pulled, we inspected the rudder shafts and found them to be in excellent condition. However, the repair of the aluminum would cause damage to the lower rudder bearing (bushing) so the vessel opted to have us remove them and fabricate new for installation. Rudder bearings are machined in our machine shop – Straight Line Marine. 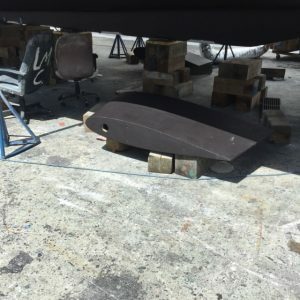 It is convenient to have a machine shop in the same facility, Lauderdale Marine Center, in order to dry fit the part and make repeated passed for a perfect fit. As part of the running gear work on this vessel, we also pulled and refurbished the props on the yacht. With the proper care, maintenance and service even a 30 year old classic boat can return to the sea for many more years of cruising the world’s oceans. As mentioned in an earlier post, we were contracted by the new owner and captain of an older 135 foot Broward Yacht to do a number of running gear and hydraulic projects on the vessel. On the running gear side, we were tasked with removing the shafts, props and rudders to inspect and refurbish the components. From the shaft perspective, we inspected them to ensure they were straight and corrosion free. 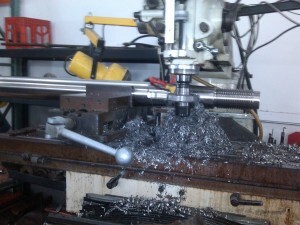 The machine shop found the shafts were slightly bent and required straightening. We also installed new cutlass bearings and repacked the stuffing box and performed an optical scope alignment before reinstalling the shafts back in the boat. As part of our standard maintenance and service process, we removed the rudders to check the bearings and packing glands. In this case, the bearings were in good shape so we did not have to replace them. We just needed to repack the stuffing boxes to complete the work on the rudder service. 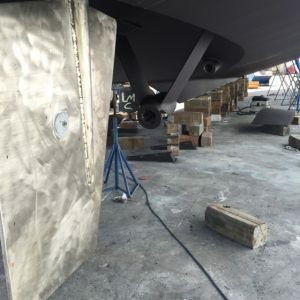 However, the challenge with removing and re-installing rudders on a yacht of this size comes with handling them. Each rudder weighs in excess of 800 pounds. 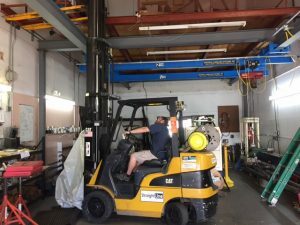 In order to do the job right, and safely, it takes precision forklift work. 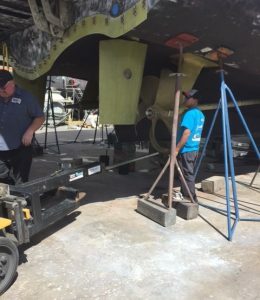 We use two lifts to start the process, one to stand the rudder in a vertical position while the second secures the rudder so that it can be moved back to the boat. Maneuvering the rudders to align the rudder shaft with the opening in the boat many times translates into a matter of moving the forklift just fractions of an inch one way or the other. After considerable team work between the mechanics and the forklift operators, we successfully re-installed the rudders and now the yacht is good to go with a complete running gear overhaul complete. It’s not unusual for mega yachts to haul out at Lauderdale Marine Center requiring extensive work on multiple parts of the boat. That was the case for a 135 foot Broward when she came into the yard. The Captain of the yacht approached High Seas with a laundry list of requirements that included hydraulics and running gear jobs. 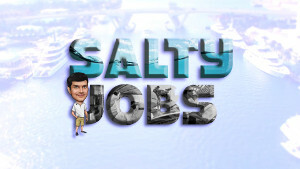 High Seas is unique in the sense that we have the expertise to work on both areas, providing a central point of contact that can help to design the most efficient work flow through coordinated schedules. In coming posts, we will walk through the steps we took to make this yacht ship shape again. To accommodate the growing marine trade at LMC and the potential for larger yachts visiting the yard for service when the new, more powerful travel lift is installed, we have upgraded and enhanced our own lifting capabilities with the installation of a new 2 ton crane along with a new 1/2 ton crane in our machine shop, Straight Line Marine. The new equipment will allow us to extended our shaft fabricating and straightening capabilities to more vessels hauling out at LMC. It is critical to make sure your shaft seal system is getting proper forced water cooling. If there is a temporary loss of cooling, the internal bearing on the Tides Seal assembly will become damaged or wear out quickly. Once damaged the seal assembly could spin with the shaft and come loose. This results in a leaking seal. Most experienced mechanics will see the leak and recommend replacing the seal. This can be done easily in the water if you have a spare seal on the shaft. However, before changing a seal you should determine if the assembly is damaged. Placing a new seal in a damaged assembly is a waste of time and a good seal. It will still leak. The internal bearing in the Tides Seal assembly should be 0.016″ larger than the shaft. 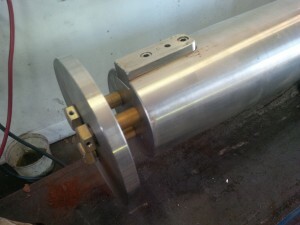 This keeps the assembly riding on the shaft and within the tolerance of the lip seal. 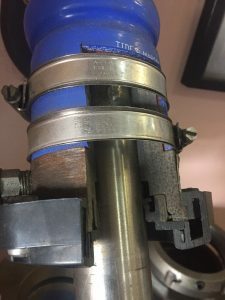 There is a simple test that you can perform on the Tides Seal in your engine room to determine if the internal bearing has failed or become worn. As you will see in this video, place your hand under the seal assembly and pull straight up. If the bearing is damaged or worn, you can lift the assembly 1/8″ or more and water will squirt in. If the bearing is still within tolerance, it will feel like you cannot move it at all on the shaft. The adjacent photos show cut-away of the Tides Seals assembly with the internal bearing and shaft. If you do have a damaged bearing the only option is to replace the assembly. This means the shaft needs to come off the transmission, slid back and coupler removed. There are divers that can plug the stern tube to do this in the water if you are well prepared and experienced. 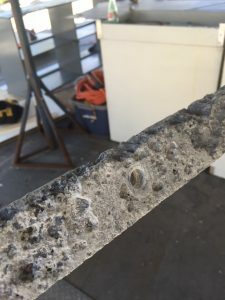 When one of our returning customers, an 87 foot Broward yacht discovered that they had significant corrosion on their stern tubes (shaft logs), they asked our running gear experts to help out. Once we removed the shafts from the boat, we were able to get a better idea of what we were dealing with on the stern tubes. The vessel is made of aluminum and was suffering from corrosion to the point where we would need to fabricate new tubes. To accomplish this, we enlisted our machine shop, Straight Line Marine. The machine shop ensured the inner diameter was machined for the cutlass bearings, drilled & tapped for alignment jacking screws and milled out water vents. Once we finished the machining process, it was time to install the new stern tubes back into the boat. The stern tubes have a cutlass bearing on each end so it is critical that the tube be aligned properly to the struts and engines. 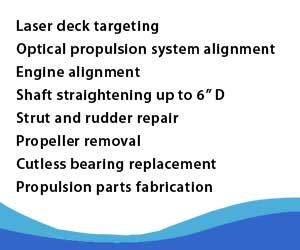 To ensure that the stern tubes would be in perfect alignment, we used a process called optical scope alignment or “scoping” for short. Scoping is the most advanced method for obtaining a perfect marine shaft alignment with struts, shaft logs, engines or v-drives. Scoping is the latest generation of alignment technology and far more advanced than the old piano wire system and even laser alignments. 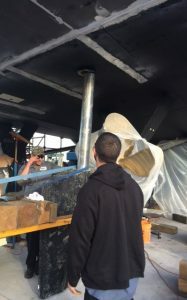 The twist here is that we used the scoping process to help the welders perfectly place the new stern tubes in the boat. With the welding complete, we were able to finish the job and ensure that the shaft and stern tubes were aligned, guaranteeing a vibration free ride for this valued customer. A 100 foot Marlow yacht was recently hauled at Lauderdale Marine Center for routine maintenance that included her running gear, hydraulics, topside paint and other services. The captain turned to High Seas Yacht Service for the ship’s running gear work and our sister company, High Seas Hydraulics for the hydraulic portion. 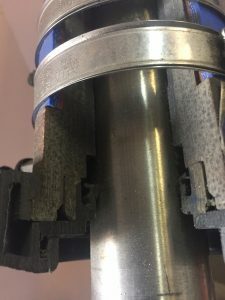 During the inspection of the bearings and seals, we found that the shafts were deeply pitted to the point that we could not fix them through a cladding or weld-over process. 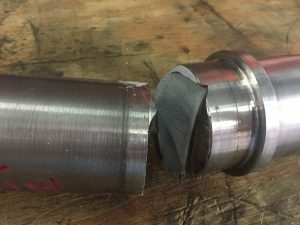 New shafts would need to be fabricated. To make the new shafts, were turned to Straight Line Marine, our full service machine shop dedicated to shaft, strut and rudder straightening for precision alignments and the elimination of running gear vibration. 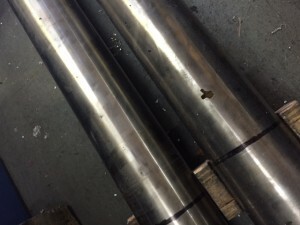 At Straight Line Marine, we can straighten or fabricate shafts up to 6 inches in diameter and perform shaft weld-overs (cladding). We are ABS Certified for Aquamet Stainless Steel Shaft Cladding. We also perform ABS shaft crack testing and straightening. As is common in many boats, this one used a coupler nut attachment with one big nut on the coupler end in the engine room. The nut that was used would be similar to a propeller nut. Since the coupler nut is usually recessed into the coupler, it takes a very large socket to tighten or loosen it. 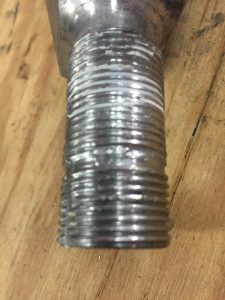 In order to perform the work, we would have to make custom sockets that would fit on a 1” wrench and then, because of the amount of torque required, put a 3 foot long pipe on the wrench to get the leverage. Because this work is happening in a very tight place, we found that we do not have enough room to swing a long pipe or get the socket in place. A more modern approach is the keeper plate or shaft locking plate. The end of the shaft is cut flush, drilled and tapped for much smaller bolts. Three ¾” hardened bolts are torqued down in a circle to draw the plate and coupler onto the shaft taper. A common ¾” socket can be used on a regular ½” or ¾” wrench. We no longer needed long cheater pipes since the torque required to draw up the plate is considerably less than that required on one big nut. This yacht now sports brand new shafts and is ready for smooth sailing.